The number of Americans not participating in the labor force hit a new record in November, exceeding 95 million for the first time, according to the latest numbers released by the Bureau of Labor Statistics. In November, there were 95,055,000 Americans not in the labor force, an increase of 446,000 people from the previous month. The bureau counts those not in the labor force as people who do not have a job and did not actively seek one in the past four weeks. The labor force participation rate, which is the percentage of the population that has a job or actively looked for one in the past month, declined from 62.8 percent in October to 62.7 percent in November. 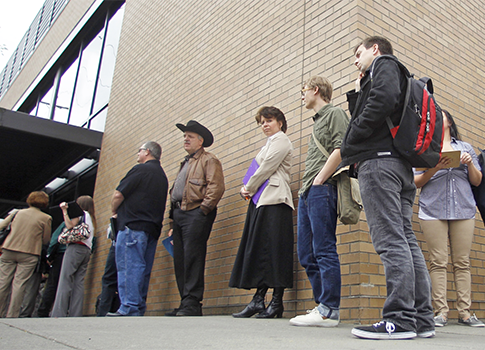 The unemployment rate for all Americans declined from 4.9 percent in October to 4.6 percent in November. This measure does not account for those individuals who have dropped out of the labor force and simply measures the percent of those who did not have a job but actively sought one over the month. While the unemployment rate declined this month, the number of Americans joining the labor force declined by 226,000 individuals. The "real" unemployment rate, otherwise known as the U-6 measure, was 9.3 percent in November, which declined from 9.5 percent in the previous month. Democrats such as Sen. Bernie Sanders (I., Vt.) and Federal Reserve chair Janet Yellen have said this measure accounts for discouraged workers and those working part time instead of full time for economic reasons and is more representative of the labor market. There were 5,669,000 Americans working part-time in November who would rather have a full-time job but cited economic reasons for not having such employment. According to the bureau, involuntary part-time workers are "persons who indicated that they would like to work full time but were working part time (1 to 34 hours) because of an economic reason, such as their hours were cut back or they were unable to find full-time jobs." "Job creation among small businesses was relatively weak in November, but there are clear signs that business owners are feeling better about the future," said National Federation of Independent Businesses president and CEO Juanita Duggan. "They are trying to hire, but they are still having a difficult time finding qualified employees." This entry was posted in Issues and tagged Bureau of Labor Statistics, Economy, Jobs, Unemployment. Bookmark the permalink.